If you are going with aftermarket wheels, you may find that offsets are sometimes limited and to get the correct brake or suspension clearance you may need to go with a spacer to push the wheel outward. We offer sets of wheel spacers in 5mm, 6mm, 12mm, 15mm, 16mm and 20mm that include the proper length lug bolts to match the thickness of the wheel spacer to keep you rolling safely. To top it off, we also offer the spacers AND lugs in chrome/silver or black to fit your style. Each quantity of 1 is a set of 2 spacers and 8 lug bolts (or 10 if you have a '5 lug' wheel). 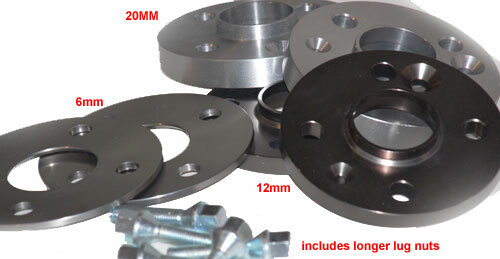 If you need spacers for the front and back, you will need to order 2 sets. Please note, new lug bolts ARE INCLUDED but NOT SHOWN. Note: there was a change in Aug of 2006 and MINI went to a larger lug with different threads, please confirm the production date of your MINI before purchasing. At this time, the black spacers are not available in hole pattern: 5x112. If you order black spacers and bolts for this hole pattern, you will receive black bolts with silver spacers and a refund of $10.00 USD.